Thank you Jeanie for coming to Buck's rescue so quickly after his neurological seizure. I have never seen him bounce back so quickly. Actually, I didn't think it was even possible. He was considerably better later that afternoon and two days after the acupuncture he was doing the stairs again. Buck is 13 1/2 and still seems like he is no more than 7 or 8. That is pretty amazing for a 90-pound Weimaraner. Thanks so much for your great care. 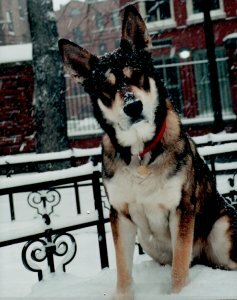 When I adopted Bentley, he was already 13 years old and had arthritis in all four legs. He was a puppy in an old dog's body, full of life and love and spirit, and the most gentle and loving dog you could ever meet. He brought a tremendous amount of joy into my life every single day. I spent many months researching every possible way that I could help him, (in addition to his vet's care) medically and holistically, and I was able to have another wonderful 3 1/2 years with my sweet boy. My only regret is that I wish I had discovered acupuncture for him sooner. I started to notice small differences after his second session, then after the third I could see quantitative improvement in his mobility. 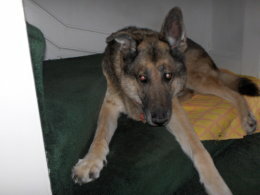 Not only was he managing the stairs much more easily, he was instigating wrestling matches with our other dog again. He was steady on his feet again, was much less stiff and pained when getting up, slept comfortably without needing to change positions several times, and most importantly, was happy, playful, and eager for walks and car rides again. He even loved the smelly liniment that I applied each day, clearly because it helped him feel so much better. Bentley passed away during the last week of January. I will always be especially grateful for the last happy five months I was able to have with him. I have no doubt that it was due in large part to his sessions with Jeanie. Her thoughtful care for him made an enormous difference in the comfort, happiness and quality of life of my dog and our household. I can't recommend her highly enough. 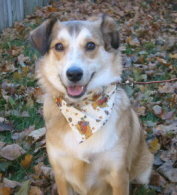 Erin is 6 year old golden retreiver/shephard mix diagnosed with hip arthritis at age 5. 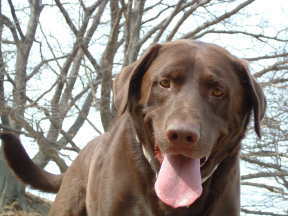 Prior to that point she was a very athletic and active dog, often running and playing off leash and able to accompany me with our other dog Milo on long walks and hikes. Over time she became reluctant climbing stairs or jumping and favored her right leg. Initially we limited all off leash activities. She went for weekly physical therapy which helped with stretching, strengthening and pain relief. We researched and tried various supplements and found some which also helped a lot. After a few months she was much better however I felt she still needed some support. Alternative medicine is part of our household practice and acupuncture is recommended for canine arthritis so I researched what was available. I found Jeanie Marie's website and felt comfortable with the information posted as well as our initial correspondance. The acupuncture coupled with diet changes and the stinky herbs have been the final boost that Erin needed. Jeanie is wonderful with the dogs and very knowledgeable with Chinese medicine and nutrition. Although we need to be diligent with her home program and still be careful with Erin's activity level, she can enjoy short periods off leash and at doggy day care. She also climbs stairs and jumps much more readily. We are grateful for the guidance and support Jeanie has provided! 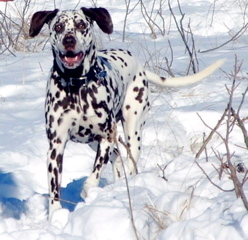 "Cuddly" Dudley, aka "the Duds," is a 16-year old Liver-Spotted Dalmatian whom we rescued when he was 18 months old. 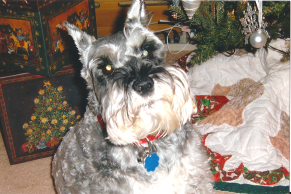 As he has aged, Dudley developed a severe case of reflux disease and debilitating arthritis in his joints. Despite changes to his diet and supplements for his digestion and joint health, he was still feeling really bad and we were afraid he wouldn't last another year. That was a couple of years ago. Fortunately we heard about and started scheduling acupuncture treatments from Jeanie Marie. It has made all the difference! Initially it was a few sessions per month, but now he only needs acupuncture only once-a-month for maintenance. These treatments have saved his life and helped him to feel good. He no longer has "acid attacks" and can still take moderate walks a few times each day. Because of her gentle manner, Dudley got used to Jeanie Marie and allowed her to use the laser, needles and "stinky herbs" rather quickly. He now even falls asleep during his 'spa day' session on the couch. We are very grateful for Jeanie Marie's professionalism, knowledge, kindness and reasonable rates and feel so lucky to have such a talented dog healer right in our neck of the woods. 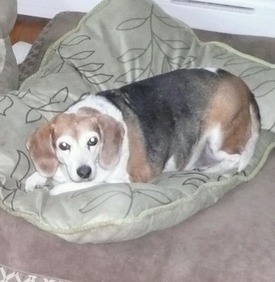 Peaches is our elderly rescue Beagle who had developed a painful front leg due to arthritis and/or injury. The vet prescribed various meds that did little to no good and we were afraid we would have to end up putting her down to eliminate her suffering. I was extremely skeptical of acupuncture, but had heard good things about Four Paws Acupuncture and wanted to exhaust all avenues of help so gave it try. We began treatment early last fall and have had results that are nearly miraculous. She initially had treatments every couple of weeks for the first few times and now is seen only every 6 weeks or so as needed. We took Jeanie's advice on her food and eliminated all wheat products which also seems to have helped substantially. She is off all meds other than a baby aspirin with meals and is completely limp and pain free with this regimen. Best of all, she's got her old Beagle sass back! Bailey is my 9 1/2 year old very beautiful & active little girl...she loves chasing "Mr. squirrel". Bailey has been battling kidney disease for 2 1/2 years now and things have been going along fairly well. 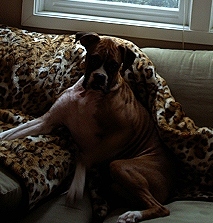 Unfortunately, two months ago, she had a really bad flair up and it looked like it was the starting of kidney failure. My heart was breaking at this news. On top of the kidney disease and it's accompanying issues, like stomach upset & ulcers taking it's toll on her, she was also suffering from arthritis everywhere. She wasn't eating, she was sick all the time and she could hardly walk. I felt like I was loosing her in a very painful way. I work at an Animal Hospital where we have been recommending Jeanie for years and a colleague said to me....CALL Jeanie! I didn't know if this was going to work, only because there was so much wrong with Bailey. But I had heard so many wonderful things about Jeanie and I felt that she would know what to do. I followed everything Jeanie suggested; food, supplements, "stinky" herbs & the scheduled acupuncture appointments. Today she is running around the backyard after Mr. Squirrel again, she wags her tail like crazy again and she is eating and drinking! She is happy, which is the most important thing I can do for her. It's amazing to watch Jeanie work. Bailey goes from this crazy Labrador retriever mode to the most calm relaxed state I have ever seen. Watching her get to that "happy" state is an overwhelming feeling of Joy for me. I can't recommend Jeanie enough ....Call her! It's amazing and it works. It is honestly nothing less than a miracle, truly! Approximately 4-5 months ago, my 10 year-old American Pit Bull Terrier, Taya, injured her back. Since her injury, most days her tail hung down off her back, lifeless. This was the biggest sign of her discomfort and pain but also she would injure herself again and again, even when simply playing. After many veterinarian visits and medication our vet recommended acupuncture. It's been 3 weeks and 3 visits since Jeanie Marie began working on my baby. She recommended a change in diet and some stinky Chinese herbs, and I adopted them. For the past two hours, Taya and I have been playing with her toy. Her tail is curled up pointing to the sky and she is peppy and happy like she was before her injury. I'm simply amazed and thankful. Jeanie Marie Kraft is an extremely competent and knowledgeable person as well as caring. She has helped to heal my dog with his anxieties and he and I can't thank her enough for it. She really has a talent with animals. They love and trust her immediately. Zack is always so excited to see her every time she visits, unlike the vet! 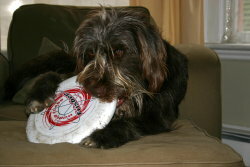 Zach is now able to play more frisbee thanks to his acupuncture sessions. 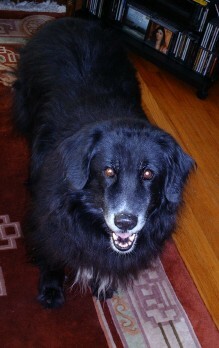 Jeanie has also worked with me and helped grow my business Professional Pet Services of Salem, my clients love her too. When I heard the words “tumor” and “amputation” from my Veterinarian I thought I was going to faint. The day I had dreaded for more than 12 years had arrived. 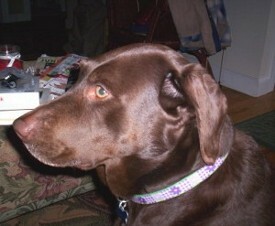 Our beloved chocolate lab, Marley was in terrible pain, the cancer eating away at the bone in her hip. We had a heart wrenching decision ahead of us – put her down and out of misery or remove her left hind leg. One surgeon said what would be her remaining back leg had a previous torn ACL which would no doubt rupture again. Another surgeon gave us the news we wanted to hear – her knee should be fine and she didn’t have an owner who regretted making the decision to amputate – dogs adapt amazingly well. 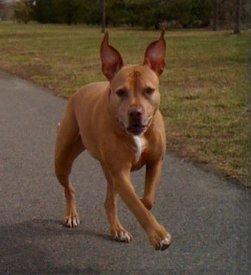 She had the surgery February 09 and here she is 6 months later – hopping around as a “tripawd”. Here she is running. Only a week or so after the surgery she was walking on her own. We made it through the surgery and recovery with the support from www.tripawds.com, an amazing site started by owners of a dog who had lost a leg from cancer. We found that we were not alone going through this! It is amazing how common dog cancer is these days. 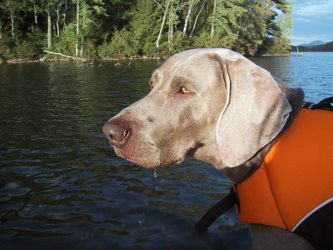 We recently took a vacation at the beach and I bought her a life jacket thinking for sure she would sink to the side, but she didn’t even need it – she swam like any 4 legger! Her prognosis was only 4-6 months, but she’s still here and there are no signs of the cancer spreading so far. We’ve changed her diet to hamburger, canned chicken, spot stew and ground up veggies. We’ve given her K9 immunity supplements and most importantly, she gets her visits from Jeanie Marie of Four Paws Acupuncture – I honestly would not have made it through this without her! Marley is so relaxed after her treatments. I love that I am doing something to make her feel better without the use of drugs which can often have side effects. Jeanie has also been such a support for me as well. She has become a dear friend and I look forward to her coming each week. Thank you so much Jeanie!! Our dog Chelsea has a lot of health issues. First off, she's eighteen years old! She's deaf, has no teeth, and she has Cushings disease. She also has Degenerative Myelopathy. Both of these diseases cause her back legs to be very weak and she has trouble standing and sometimes walking. She was falling around a lot at first. She also received Adequan shots for arthritis in her hips. Unfortunately, the shots would give her diarrhea. Our Vet suggested we try acupuncture and recommended Jeanie Marie Kraft of Four Paws Acupuncture. After the first couple of treatments, Chelsea was walking better, and not falling around as much. After a couple more treatments, we noticed she seemed to be calmer, happier and just more at peace. She even runs around the yard on occasion! We now get a treatment about every three weeks or so. Jeanie is so caring and knowledgeable. I'm really not sure if Chelsea would still be with us had we not tried the acupuncture. As Jeanie says, we're beginning to think she's immortal! When our sixteen year old mini-poodle, Gabby, started to show signs of stiffness in her rear legs our vet suggested acupuncture as an option to traditional treatment. We gave Jeanie Marie a call in early September, 2008 and since then her weekly visits have been a highlight for the entire family. Jeanie Marie's focus on acupuncture, diet and eastern remedies allows us to spend time on making Gabby healthy and comfortable rather than focusing on illness. Gabby has benefited with increased stability, more restful sleep and 100% improvement in her digestive system resulting in some much needed weight gain and increased vigor! Her favorite needle spot? Stomach 36! We have all benefited from 4 Paws. Basmati rice is now a favorite addition to our meals and "fire water" is applied to everyone's sore joints and muscles. Thank you Jeanie Marie for giving Gabby a new lease on life! 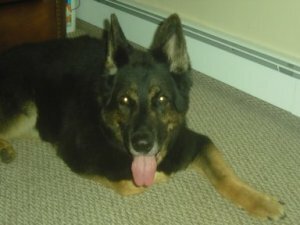 Belle (Bellie) is a 12 year old German Shepherd rescued from a shelter. Over the last 6 months her hips have started to bother her. She started to fall while chasing the ball, and was in obvious distress getting up from a lying down position. Going up and down the stairs have become a chore and she can no longer get up on the bed. This winter has been particularly difficult for Bellie. She can no longer bound through the snow or gracefully walk on the ice, leaving her with back legs that are shaking and in pain. The pained expression on her face was visible. Her vet prescribed an anti-inflammatory medication that made her sick after one dose. She suggested a different medication as well as acupuncture. Bellie was able to tolerate the new medication and it seemed to be helping her with the pain, but also appeared to make her lethargic. I searched the internet for “doggie acupuncture” and was blessed to find Jeanie Marie Kraft. Belle is the type of dog that violently shakes with fear when she goes to the vet and has to get on a table. Jeanie Marie, on the other hand, came to her. 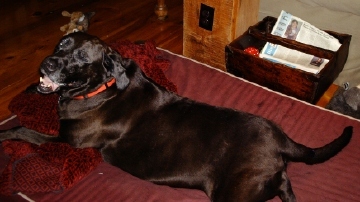 Belle was treated in her own bed and has been meeting with Jeanie for 7 weeks now. She is in pure heaven when she is having a treatment. She looks forward to it, and has a big smile on her face when I tell her “Jeanie is here”. The acupuncture has helped her. I no longer give her any medications, rather, we depend on her acupuncture and home treatment that Jeanie Marie has prescribed. You can see the “relief” on Bellie’s face. I am very grateful that we have had the opportunity to work with Jeanie. Belle is the love of my life, and to see her more relaxed state, her smile, and her pain-free expression when she looks at me is the most wonderful gift I could ever receive. 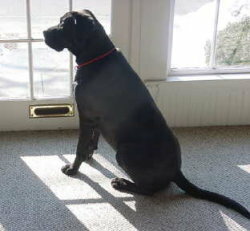 "Dewey’s our 3+ year old Lab mix and he unfortunately had to have surgery on his right hind leg (luxating patella and partial cruciate tear) in April of 2008 as he would labor to merely get up and down. The surgery was relatively successful (not a cure all), but the recuperation proved to be both challenging and unpleasant and we sought to make this move as quickly and as comfortable as possible for him. This is where a combination of adequan shots and, separately, Jeanie of Four Paws Acupuncture, have come in and really helped. The first treatment and those thereafter went and continue to go well… Dewey was a gentleman, comfortable and slept like a baby following it. The next morning he was “jacked and pumped” and as playful as a puppy which encouraged us. For follow ups, Jeanie recommended weekly treatments, giving way to every other week, every three weeks and finally monthly to an “as needed,” tune up basis. "Clyde was a fit active 9 year old when, in March 2008, he suffered a ruptured disc, which damaged his spinal cord and left him paralyzed in his rear quarter. 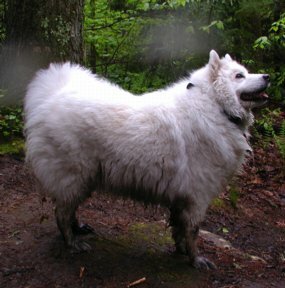 After surgery, he was completely down, but in May 2008, after much love and care, he was able to walk using his right rear leg and dragging his left rear leg. We started physical and aqua therapy within a couple of months of surgery, which greatly strengthened his right leg and enabled him to use his left leg somewhat. We then added acupuncture to his rehabilitation, and immediately experienced a huge improvement in his overall strength and ability to get around. He can now walk around the block again, and can do a lot of the things he used to do. Just recently, he was able to climb six stairs without any aid, which is a huge accomplishment. Acupuncture, along with physical therapy, keeps him going and allows him to have a somewhat normal life." "My dear sweet,handsome boy Ozzy, 8 1/2 year old Boxer/Black Lab mix, has been diagnosed with bone cancer in his left front paw and it has spread to his lungs. The bad news is that there is no cure. The good news is that it has brought Jeanie Marie of Four Paws Acupuncture into our lives. Her skill, knowledge and compassion has comforted and sustained us both. Through the use of acupuncture, herbs and massage Ozzy has continued to function with minimal pain and the progression of the disease has slowed. He is happy and still maintains his energy, sense of humor and tremendous appetite. Without Jeanie Marie I don't think Ozzy would still be with us and I am happy with every day we have with Ozzy." Fortunately we heard about the possibility treat the torn ligaments using the Chinese Medicine. After consulting with Jeanie Marie Kraft of Four Paws Acupuncture we started Max on a regimen of acupuncture and massages with a Chinese liniment. 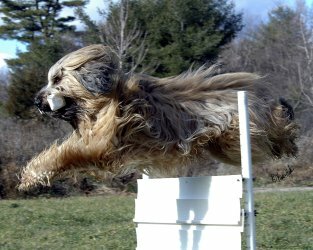 Needless to say there wouldn't be any jumping in the foreseeable future for Max, a tough task for the highest titled obedience performance Briard in North America (11 US and Canadian titles). Now it is 3 1/2 months later and CH Glendrovers Sir Maxwell UDX, CanOTCH is back to doing what he likes best - obedience and agility performance. Thank you Jeanie Marie for getting our baby back in the performance competition arena!" 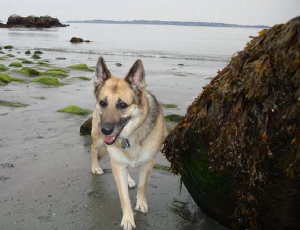 "Our playful, super friendly German Shepherd, Alex, had a wonderful and healthy 12 years as a member of our very busy family. In Spring of 2007, he begged to go on an exceptionally long walk, visiting all his favorite haunts. Afterward, for 3 days he collapsed in pain & exhaustion, barely moving, not eating and barely drinking. It looked like walking was over for him. Though he slowly came around to taking some interest in life, despite his meds and our TLC, he was clearly suffering. Our vet, Dr Rockwell of Atlantic Veterinary Hospital, recommended we contact Four Paws Acupuncture, and Jeanie Marie, L.Ac. came into Alex's life. He loved her visits. Even more importantly, afterward he would seem happy, a bit playful, and very relaxed. He survived through many weeks with her tender loving acupuncture and massage. Late May of 2008 his time to go became apparent after a fall down the stairs. His neurological was too severe. We were so grateful to Jeanie Marie that she was be able to help Alex be more comfortable through his final days. He lived to just shy of 13 yrs." 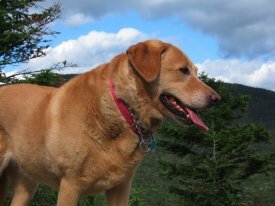 "Eight months ago, my dog Kobe was diagnosed with hip dysplasia and arthritis. I could see the pain in his eyes, the limp in his walk. His movement was slow; he had a hard time going up and down the stairs. He could barely finish a mile walk. 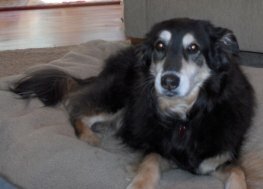 My young 5 year old Collie mix was not well. I tried traditional things that his vet suggested, but nothing seemed to help. I heard about canine acupuncture from a friend, and I had to try it! Within a short time, I could see a difference! My dog could finish a two mile walk with ease; he could run and jump and play! 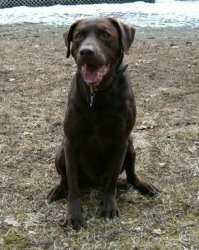 With the help of acupuncture and the suggestions Jeanie made about changing his diet and trying new supplements, my dog was feeling better and stronger! He still has a bad day every now and then, but those sad, pain filled eyes are gone and my happy, loving therapy dog Kobe is back! Thank you Jeanie, we will be forever grateful!" 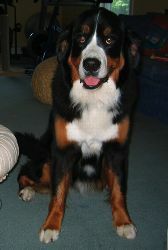 "Bruschi was diagnosed with Wobblers Disease a year ago. It was recommended to us to have his neck fused to help him be more stable on his feet. We did not agree. We found a local chiropractor who also specialized in adjusting animals. We had Bruschi adjusted twice a month. It helped him for a while but when we started to notice him "wobbling" more, we increased his adjustments to once a week. We also researched acupuncture and its benefits and decided to try it along with chiropractic. Jeanie came to the house (which is great because Bruschi doesn't fit in many vehicles) and discussed not only Bruschi's health but also his diet with us. She gave us an information packet on many holistic foods, and Chinese herbs for us to research. I, like many others, thought what I was feeding my dogs was good for him. I was wrong. We changed his food to Solid Gold "Wolf King", and he loves it. We have noticed also that his body does not have a constant odor and his ears are not as dirty. The new food has even helped his allergies. 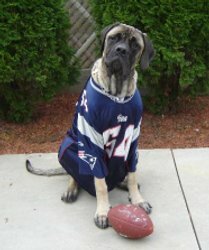 Jeanie recommended we treat Bruschi once a week for 4-6 wks along with his adjustments. It has been a month and I am happy to say Bruschi is much better. He walks with more confidence, he rarely falls (unless his sister pushes him), his drive to play is back (Bruschi has O.C.D. for basketballs, footballs). We know there is no cure for Wobblers, but we feel having Bruschi treated using acupuncture and chiropractic is the right thing to do. We are also trying a magnetic collar that Jeanie gave us. Say no to spinal surgery................say yes to acupuncture and chiropractic"
"Montana was 7 or 8 years old when he came to live with us, his third home. He had suffered an injury in his first home that left him with a permanent limp in his front leg. He wasn't slowed down by that, though, and loved his swims, walks, and playing with his canine brother and sister. Five years later, Montana still had the desire to do all those Lab things, but unfortunately had developed arthritis in his rear end. This left him with only one good leg, and severely limited his mobility. He also had a bad reaction to pain medication, so our options for treatment were limited. We decided to try a combination of acupuncture and physical therapy, and the difference has been remarkable. 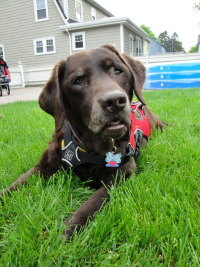 Montana also has a paralyzed larynx, a not-uncommon condition in elderly Labs. He (and we) were tormented by a hacking, choking cough. Treatment with acupuncture has virtually eliminated this, allowing all of us to rest more comfortably. All the dogs really enjoy Jeanie's visits. I'm pretty sure that's the cookies and the love, though, and not just the treatment itself!" 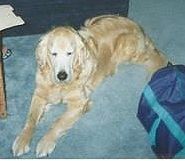 "Since day one, I am very impressed with the care Jeanie provides for my Golden. She has an enormous amount of information to share, a genuine compassion for him and my concerns with his health. In just 7 visits I have seen a 360 in his walking ability and also his bladder/kidney problems have improved. Putting him on the Chinese Herbs, he has a lot more control going to the bathroom. Having an old dog with degenerative myeopathy, his comfort level improving, has been a big relief to me. Using acupuncture on my dog gives me my own piece of mind. I highly recommend using Jeanie for your animals. Dudley loves the cookies too, he is spoiled from the second, she walks in the door." "Oso, was experiencing a high sensitivity to loud noises and an increased level of overall stress and anxiety. We live near yacht clubs where canons are shot off at sunrise and sunset 6 months of the year. That noise and summer fireworks were more than she could cope with. Noises coming from construction in the area added to the cacophony of her world! Getting her to leave the house, let alone the property, was extremely difficult. Walks finally had to stop. She had a loss of appetite. She was so anxious and scared! She looked like she couldn't even hear us speaking to her because of the state she was in. Her boogie man was everywhere it seemed! Jeanie's acupuncture sessions were amazing and immediately brought a sense of relief to Oso and over time brought such a state of calm. What was just as important as the acupuncture was Jeanie's advice on putting Bach flower essences in her water, massaging them on her head and ears, and adding them to dog treats. Jeanie's prescription worked! We learned that it was imperative to be consistent with these remedies so that they could work in tandem with the acupuncture, and that these steps were, indeed, an important contribution to the success that we were seeing! Oso is happy and energetic now, and enjoying her walks everywhere. She is relaxed and calm and can hear us now when we are talking to her. Her appetite is back and her overall appearance is bright, alert and present! We are grateful for Jeanie, her wisdom, knowledge, professionalism and deep sense of caring that turned Oso's life around and brought back every bit of happiness this dog deserves! Paws and slurps!" "Lyme Disease, the price dog owners pay for letting their dogs be dogs. 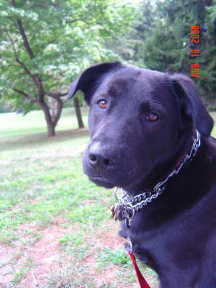 Jazz, my 10 year old Labrador Retriever, was diagnosed with very high levels of Lyme Tick titers in January 2007. She was walking like she had glass under her paws, limping badly. Her vet, Dr. Rockwell, put her on antibiotics and I thought for sure all was well. Her limping and malaise disappeared, but after a couple months her symptoms returned and she was prescribed antibiotics again, as well as Rymadyl (a NSAID) for pain and inflammation relief. During her annual checkup her blood work showed increased liver enzyme levels due to the drug. During a discussion with Dr. Rockwell he mentioned acupuncture as a treatment he recommended. My final decision to start acupuncture came this fall when Jazz's lyme titer test came back with the highest levels possible. So after talking with the staff at Atlantic Veterinary Hospital, and their glowing recommendation of Jeanie Marie Kraft, I decided to use her acupuncture skills with antibiotics to fight this disease. My poor Jazz was on the fast slope towards death. Her energy levels were low, she struggled to get up, her back hurt so bad she would fall right to the ground when touched. After Jeanie's first visit I noticed some improvement. Jeanie also prescribed Chinese herbs and liniment that has helped. After two months of treatment I now see Jazz heading up the slope. The pain in her back is gone and she can stretch once again. She may not climb Mt. LaFayette again, but in the house she is running around and jumps right up from laying down. Jazz looks forward to her treatments and does very well the next day. I love not having to lift Jazz into my SUV to bring her for a visit. Jeanie comes to our house with her big smile and love of dogs. She is very organized and punctual. After my experience, I whole-heartedly recommend acupuncture." 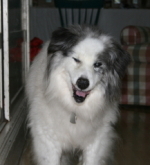 "I found Jeanie after my dog Pandora, who is 13 years old, ate a peach pit which then lodged in her small intestine. Following emergency surgery Pandora was extremely uncomfortable and anxious and she had poor control of her bladder. Her prior difficulty climbing stairs to our second and third floor home was much worse. 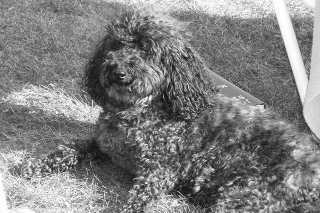 I despaired that Pandora who had been an active and energetic 13 year old dog who loved to run and walk in the woods would ever be the same. Searching for anything that would work, I decided to try acupuncture. I talked to a number of acupuncturists, but Jeanie was the most compassionate and warm. Even before Jeanie saw Pandora she made some extremely helpful suggestions about diet and care. Jeanie's acupuncture treatments have been the turning point in Pandora's recovery. From the first treatment Pandora made giant leaps forward. Her anxiety was reduced, her bladder control improved and her problems climbing stairs began to diminish. Now after 5 treatments, Pandora is doing fabulously. She races up the stairs. Her legs are even stronger than before the surgery. On our trips to the woods, she is running and jumping again. Once more she is the bright-eyed energetic dog that brings so much joy to my life." 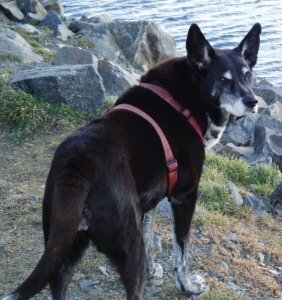 "Allie is our 'first child,' a border collie mix that we adopted 12 years ago. Three years ago, she tore the ACL in her back right leg, and had 2 surgeries to repair it. This past winter, the ACL in her other leg tore. I was heartbroken, because I didn't want to put her through another surgery. I thought that it was the only option. My vet suggested acupuncture. I was very skeptical at first, but after 2 to 3 visits, Allie was starting to move better. Allie seems to understand that a visit from Miss Jeanie results in her feeling much better, so she is so excited when she sees her. I believe that Jeanie's treatments are improving Allie's quality of life. We thought that we were going to have to put her down this past winter, and here it is, almost fall, and she is still with us. Thanks Jeanie, for the compassionate care that you give to Allie." "I can't express how much Jeanie's gentle care has meant to Zachary and to me. 18 months ago Zachary was diagnosed with a malignant Spindle Cell tumor on his left front paw. My traditional vet recommended amputation and 12 courses of chemotherapy. Zach would have to be sedated each time. With that course of treatment his life expectancy was projected to be three years; without it, about three months. Six months earlier he had undergone back surgery for a ruptured disk leaving him with weakened rear legs. 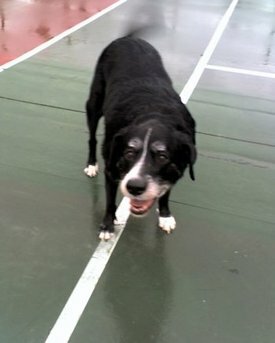 I did not feel that at age 11, amputation was an alternative for a 98 pound dog with a bad back. We embraced a holistic alternative with homeopathic meds and an organic home-made diet. 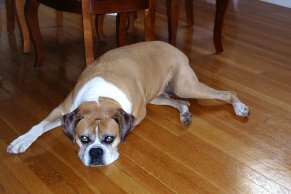 Zach thrived for a year, but alas the tumor began to grow and began causing him discomfort and he became very lethargic. It was then that we decided to try acupuncture. I was skeptical, but quickly became a convert when Zach basically relaxed and SLEPT through the first treatment. The results were dramatic. He is again a happy dog after each acupuncture treatment. He is much more energetic, moves more easily, rolls around on the grass, swims and basically enjoys life. The acupuncture won't cure the cancer, but it is certainly improving his quality of life. Jeanie's loving attention, informed advise and gentle care is a Godsend through this very difficult transition." "Thank you so much for all you have done for Bear!!! Before you started treating him, he was very wobbly and fell frequently. I was scared to death that before long I would have no choice and be forced to 'do the humane thing.' I would do anything for my 'best friend' and it definitely paid off! After his fourth treatment I woke up the next morning to a 'miracle'!!! He was walking better than he had in several months. The effects last for a longer period of time each treatment. Even his face looks younger and more relaxed. I admit, I was skeptical at first, but I am now 100% convinced that the acupuncture has helped him. I have already begun to recommend acupuncture to people. I look forward to your visit each week, and so do all 3 dogs. (I'm sure the cookies have nothing to do with it!)" My parents took me for an ultrasound about a month ago and found out that I have untreatable cancer. I am very sick. I really wasn't feeling well and didn't want to eat anything at all. As we were walking down the street toward home, we ran into Jeanie in front of her house. My mom started to cry as she told Jeanie what they found on the ultrasound that morning. I really wasn't doing well. Well, a little bit later Jeanie came over. She treated me for about 15 minutes and I started feeling SO much better! I ate some treats during the treatment and then decided I'd like some roast beef afterward! I felt relaxed and relieved and so did my parents! I've been eating regularly since that day and definitely look forward to Jeanie's visits. I know she can't cure my cancer, but now I know that her treatments make me feel better, so I lay quietly and let her use the laser on me. It feels wonderful and makes my arthritis and other aches feel so much better. My appetite and energy are much better now and I'm loving life again. Walks and rides are SO much fun! My parents, my brother Koty and I are so thankful to Jeanie. She has made a huge difference in our lives and we appreciate all that she does for our family. "It's hard to explain in words how Jeanie has made life so much nicer for my dog, Thea. Thea is just about 12 years old and has pretty severe arthritis. By coming to our home to provide acupuncture services, where my dog is comfortable and relaxed, have made these appointments 100% better for both my dog and myself. Jeanie always has a loving and kind manner toward my dog and greets Thea as if they were old friends, which makes Thea (and me) happy and relaxed. Jeanie is the only professional that my dog will take a bone from. It's shocks me every single appointment and my dog comes back to her for more! That may seem small to someone who doesn't know Thea, but to us it's makes a very big statement. The acupuncture has made a very big difference in my dog's quality of life. 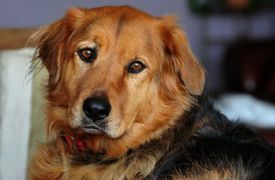 It enables my dog to have relief from the pain of her arthritis (and it shows, dogs can't pretend) and Jeanie also has recommended other natural remedies to help my dog be stress free and pain free. Not only that, she is always bringing Thea some type of goodie and Thea has come to really look forward to that! I can't thank Jeanie enough, I don't know what we would do without you!" "I sought alternatives to surgery because of the long recovery period required in a crate (12 weeks). I also consulted with a famous canine orthopedic surgeon in Boston who prescribed another anti-inflammatory that made Nikki very ill. Of course, all said surgery was necessary, but I think natural is the way to go. A home cooked diet also increases the dog's immune system. I see the difference in Nikki, with your treatments and a natural diet she 'glows' with good health and strength. As for the greatest gift you have given my dog it was watching her traveling so comfortably, walking the slick floors of two airports without so much as a stumble or a limp.Your treatment has eased her pain and restored her quality of dog life. That has been the greatest gift to me. I just finished giving her a dinner of freshly made oats, turkey and green beans made with fresh garlic and she loved every bite. Monday, Jan. 8th is her seventh birthday." "Louie is on some heavy duty anti-fungal drugs for his allergies. I think the acupuncture is good for him. He also enjoys seeing Jeanie. And for the time she is here he, and lets face it myself, are very relaxed. He actually seems zen like when Jeanie is here." 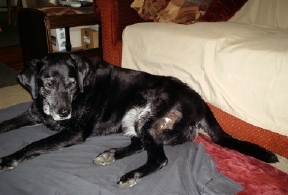 "Acupuncture has enabled her to play like a puppy again, despite her arthritis"
"Acupuncture has seemed to have helped Sadie's overall health. She has been more calm and stable since her treatments began. Cooking for Sadie has helped to calm her and she seems satisfied. She is no longer begging when we eat our own dinner." "After a six week treatment session, Kiki can now make it up and down stairs on her own and her mobility overall has markedly improved." "He is feeling fabulous....bouncing around like a nut!" 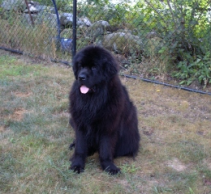 Henry is a one year-old newfie with hip dysplasia, who has responded very well to acupuncture.